Bring the Disney magic to life with this Mary Poppins inspired necklace by Chamilia. 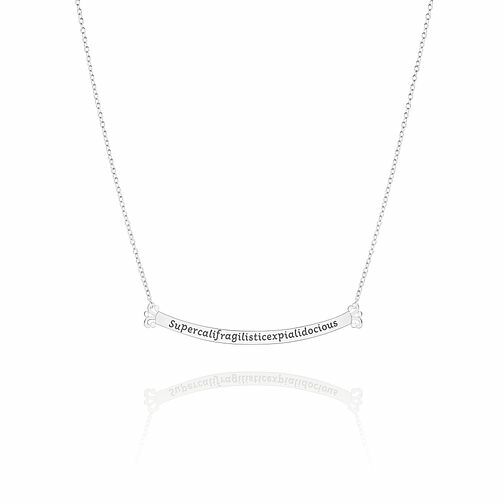 With the signature 'Supercalifragilisticexpialidocious', this stunning sterling silver necklace adds a fun and fashionable touch to your outfit, practically perfect in every way! Chamilia Disney Mary Poppins Supercalifragilistic Necklace is rated 4.0 out of 5 by 2. Rated 3 out of 5 by Anonymous from Lovely item shocking delivery The necklace itself is lovely and a must for any Mary Poppins fan. I also bought the matching bracelet in store. My necklace unfortunately arrived in a shocking state. It was hanging half in and out of the box and was a huge tangled mess of a knot. It took me several hours to untangle it and when I complained on line I was told to simply take it in store and they would advise. The reply to my email came two days after my initial complaint by which time I had untangled it. I sent an email response stated how unhappy I was by the state it had arrived even though I had untangled it and have had zero response. Sadly because of this I doubt I will place an online order again. Great product, bad service. Rated 5 out of 5 by Anonymous from good idea Nice item for a dainty person I would prefer to pay more for a heavier item.